Received: December 4, 2017; Revised: July 5, 2018; Accepted: August 8, 2018; Published online: September 27, 2018. Cis-3-O-p-hydroxycinnamoyl ursolic acid (HCUA), a triterpenoid compound, was purified from Elaeagnus oldhamii Maxim. This traditional medicinal plant has been used for treating rheumatoid arthritis and lung disorders as well as for its anti-inflammation and anticancer activities. This study aimed to investigate the anti-proliferative and apoptotic-inducing activities of HCUA in oral cancer cells. HCUA exhibited anti-proliferative activity in oral cancer cell lines (Ca9-22 and SAS cells), but not in normal oral fibroblasts. The inhibitory concentration of HCUA that resulted in 50% viability was 24.0 µM and 17.8 µM for Ca9-22 and SAS cells, respectively. Moreover, HCUA increased the number of cells in the sub-G1 arrest phase and apoptosis in a concentration-dependent manner in both oral cancer cell lines, but not in normal oral fibroblasts. Importantly, HCUA induced p53-mediated transcriptional regulation of pro-apoptotic proteins (Bax, Bak, Bim, Noxa, and PUMA), which are associated with mitochondrial apoptosis in oral cancer cells via the loss of mitochondrial membrane potential. HCUA triggered the production of intracellular reactive oxygen species (ROS) that was ascertained to be involved in HCUA-induced apoptosis by the ROS inhibitors YCG063 and N-acetyl-L-cysteine. As a result, HCUA had potential antitumor activity to oral cancer cells through eliciting ROS-dependent and p53-mediated mitochondrial apoptosis. Overall, HCUA could be applicable for the development of anticancer agents against human oral cancer. Elaeagnus (Elaeagnaceae) has pharmacological effects as an anti-inflammatory, anti-edema, anti-nociceptive, and muscle relaxant. It has been widely used to treat indigestion and osteoarthritis, enhance blood alcohol clearance, and prevent coronary heart disease (Liang et al., 2015; Du et al., 2016; Panahi et al., 2016). Elaeagnus oldhamii Maxim., a traditional herbal medicine in Taiwan, is utilized in the treatment of rheumatoid arthritis and lung disorder. Isolated triterpenoid compounds of Elaeagnus oldhamii Maxim. exhibit biological activities including analgesic, anti-inflammation, and anti-lung cancer activities (Liao et al., 2012, 2013, 2014). Triterpenoid compounds such as ursolic acid, oleanolic acid, lupeol, avicins, oleanane, pristimer, and ursane demonstrate a variety of antitumor activities against breast cancer, skin cancer, ovarian cancer, non-small cell lung cancer, and prostate cancer (Kim et al., 2016; Mendes et al., 2016; Nakanishi et al., 2016; Ren et al., 2016; Wu et al., 2016; Yin et al., 2016). Ursolic acid (UA) is an attractive compound with potent anticancer activity in several types of cancers such as melanoma, leukemia, colorectal, lung, and breast cancers (Cai et al., 2017). Ursolic acid displays various anticancer actions by reducing oncogene expression, modulating cell cycle, triggering apoptosis, suppressing metastasis, and regulating drug resistance (Zhang et al., 2007; Manu and Kuttan, 2008; Lin et al., 2013; Ou et al., 2014; Xiang et al., 2015). Ursolic acid derivatives such as FZU-03,010, ursolic acid-benzylidine, UP12, and IUA have been demonstrated as potent anticancer agents against hepatocellular carcinoma, osteosarcoma, lung, colon, and breast cancer cells (Chen et al., 2014; Dong et al., 2015; Dar et al., 2016; Li et al., 2017). However, the antitumor activity of ursolic acid derivatives in oral cancers has been rarely reported. Cis-3-O-p-hydroxycinnamoyl ursolic acid (HCUA), a novel ursolic acid derivative, has been identified in Elaeagnus oldhamii Maxim. (Liao et al., 2013). Therefore, the antitumor activity of HCUA to oral cancers is still unclear and needs further investigations. Oral cancer is one of the fastest moving malignancies with nearly 300,000 new cases per year in the world, and is ranked as the 12th most common cancer in the world (Misra et al., 2008). Most oral cancers (near 90%) are oral squamous cell carcinoma (OSCC), which is a highly invasive and metastatic cancer with high mortality (Neville and Day, 2002; Parkin et al., 2005). Its prevalence was markedly increased in Asia, correlating with betel quid chewing, alcohol consumption, and smoking (Ko et al., 1995; Sturgis, 2004). The death rate of oral cancer ranks fourth out of the top 10 malignancies for men in Taiwan in 2015 (Chang et al., 2016), which highlights the increased morbidity of oral cancer in males in recent years. The current treatment for oral cancer is surgical excision of the tumor tissues, combination radiation therapy with chemotherapy, and surgical excision with chemotherapy. However, less than 50% of cases of OSCC receiving surgery or radiotherapy plus chemotherapy survive more than five years (Vokes et al., 1993; Su et al., 2010; Lin et al., 2011). Therefore, effective and affordable therapeutic agents are urgently needed for reducing mortality, inhibiting morbidity of OSCC, and improving the quality of life for patients with oral cancer. This study investigated the antitumor activity of HCUA in oral cancer cell lines Ca9-22 and SAS using assays for cell proliferation, cell cycle, and apoptosis. The anti-proliferative mechanism of HCUA against oral cancer cells was further examined by assessing the mitochondrial membrane potential, caspase activity, p53-mediated transcription, and reactive oxygen species (ROS) production. Eventually, the ROS inhibitors were used to confirm the ROS-dependent apoptosis of oral cancer cells in response to HCUA treatment. Two human oral cancer cell lines, OSCC SAS and gingival Ca9-22 cells, were analyzed in this study. Human normal oral fibroblasts (OF), which were isolated from human oral tissue, were kindly provided from Dr. Ming-Ching Kao at China Medical University. Oral cancer cells were cultured in DMEM medium (HyClone Laboratories, Logan, UT, USA), as described in our prior report (Jou et al., 2015). HCUA, previously identified in the leaves of E. oldhamii Maxim, was purified from re-separation by silica gel column chromatography and semipreparative HPLC, as described in our prior report (Liao et al., 2013). 13C-NMR and 1H-NMR spectra of purified HCUA were further examined to confirm the structure of HCUA (Fig. 1A). The anti-proliferative activities of HCUA in Ca9-22, SAS, and OF cells were assessed by the MTT (3-[4,5-dimethylthiazol-2-yl]-2,5-diphenyltetrazolium bromide) assay. Ca9-22, SAS, or OF cells (5×104 cells/mL) were placed in 96-well plates and then treated with HCUA at concentrations of 0.1, 1, 5, 10, 20, 50, 100, and 200 µM at 37°C in a 5% CO2 incubator. After a 48-h incubation, cells were treated with 10 µL of MTT solution (5 mg/mL) for 4 h, and then mixed with 100 µL stop solution for dissolving formazan crystals. The optical density (OD) at 570–630 nm for each well was measured with the BioTek FLx800 micro-ELISA reader. The 50% inhibitory concentrations (IC50) of HCUA for Ca9-22, SAS, and OF cells were calculated based on survival rate of the treated cells. Cells were treated with HCUA (0, 1, 10, and 20 µM) for 48 h, and then collected for sub-G1 arrest and apoptosis analyses. In the sub-G1 arrest assay, cells were fixed in 70% ethanol overnight, washed in cold PBS, and stained by propidium iodide (PI, 1 µg/mL). For the apoptosis assay, viable cells were directly stained using Annexin V-FITC (200 µg/ml) and PI. After staining, cells were analyzed by flow cytometry as described in our prior report (Jou et al., 2015). 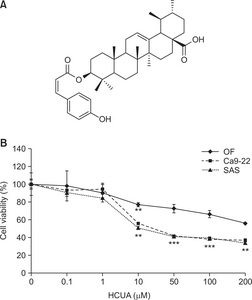 Ca9-22 and SAS cells were treated with HCUA at 1, 10, and 20 µM for 48 h, harvested, and then stained with the 3,3′-dihexyloxacarbocyanine iodide (DiOC6) solution (1 µg/mL in PBS) at 37°C for 1 h. The cells were subsequently examined using flow cytometry with an excitation wavelength of 488 nm and an emission wavelength of 530 nm. Ca9-22 and SAS cells were collected 24 and 48 h posttreatment, and then suspended in RIPA lysis buffer (Roche Diagnostics, San Francisco, CA, USA). The lysate was mixed with the sample buffer, boiled for 8 min, separated by 10% sodium dodecyl sulfate-polyacrylamide gel electrophoresis (SDS-PAGE), and then analyzed by western blotting assays, as described in our prior report (Yang et al., 2013). The blots were probed with specific primary antibodies against phos-pho-p53 (Ser15), p53, Bax, Bak, and β-actin (Cell signaling, Danvers, MA, USA). Next, they were reacted with HRP-conjugated anti-mouse or anti-rabbit IgG antibodies (Invitrogen, Carlsbad, CA, USA). Immunoreactive bands were developed using chemiluminescent western blotting detection reagents, and then imaged. Total RNA of oral cancer cells was extracted using the RNA purification kit 24 h post-treatment (Invitrogen), and then reverse-transcribed into cDNA with oligo dT primers and SuperScript III reverse transcriptase (Thermo Fisher, Waltham, MA, USA). Two-step RT-PCR was performed using SYBR Green I as described in our prior report (Wang et al., 2012). Oligonucleotide primer pairs were as follows: (1) 5′-AGTGGGTATTTCTCTTTTGACACAG-3′ and 5′-GTCTCCAATACGCCGCAACT-3′ for human Bim, (2) 5′-GACGACCTCAACGCACAGTA-3′ and 5′-CACCTAAT TGGGCTCCATCT-3′ for human PUMA, (3) 5′-GAGATGCCT GGGAAGAAGG-3′ and 5′-TTCTGCCGGAAGTT CAGTTT-3′ for human Noxa, and (4) 5′-CCACCCATGGCAAATTCC-3′ and 5′-TGGGATTTCCATTGATGACAAG-3′ for human GAPDH. Relative mRNA levels of the indicated genes were normalized by housekeeping gene GAPDH. HCUA-treated Ca9-22 cells were harvested and stained with 10 µM 2,7-dichlorodihydrofluorescein diacetate (DCFH-DA) at 37°C for 30 min in a dark room. Later, the DCF fluorescence in stained cells was analyzed using flow cytometry with an excitation wavelength of 485 nm and emission wavelength of 530 nm. The DCF fluorescence intensity reflected the ROS activity with the oxidation of DCFH-DA. To confirm whether the ROS production played a role in HCUA-induced apoptosis, Ca9-22 cells were also co-treated with HCUA and ROS inhibitors (YCG063 and NAC [N-acetyl-L-cysteine]) that were purchased from Sigma-Aldrich, and then assessed by DCFH-DA staining plus flow cytometry analysis, as mentioned above. To evaluate the proliferative inhibition effect of HCUA on oral cancer cells, the survival rate of Ca9-22 and SAS cells treated with HCUA were assessed using the MTT assay. HCUA inhibited the growth of both oral cancer cell lines in a concentration-dependent manner (Fig. 1B). The IC50 of HCUA on cell proliferation was 24.0 and 17.8 µM for Ca9-22 and SAS cells, respectively. However, HCUA had a small inhibitory effect (IC50>200 µM) on the growth of human OF cells (Fig. 1B). The result indicated that HCUA significantly inhibited the growth of oral cancer cell lines Ca9-22 and SAS, exerting an anti-proliferative activity against oral cancer cells at low concentrations. To examine the sub-G1 arrest and apoptosis induction effect of HCUA on oral cancer cells and normal OFs, the cell cycle profiles of Ca9-22, SAS and OF cells were analyzed using PI staining with flow cytometry 48 h post-treatment (Fig. 2). HCUA at 10 and 20 µM significantly increased the population of cells in the sub-G1 arrest phase in Ca9-22 and SAS cells, but not OF cells. The percentage of the sub-G1 population was 82.1% and 63.9% in Ca9-22 and SAS cells, respectively, in the presence of 10 µM HCUA. In order to further confirm the apoptotic event induced by HCUA, treated cells were double-stained using annexin V-FITC and PI, and then analyzed by flow cytometry (Fig. 3). The result showed that HCUA triggered apoptosis of oral cancer cells in a concentration-dependent manner. After treatment with 10 µM HCUA, the percentages of cells in early apoptosis (annexin V positive/PI negative) were 26.4% and 36.7% in Ca9-22 and SAS cells, respectively (Fig. 3B). Moreover, the percentages of cells in late apoptosis (annexin V positive/PI positive) were 20.3% and 33.4% in Ca9-22 and SAS cells treated with 10 µM HCUA, respectively (Fig. 3C). However, HCUA had no significant effect on cells in sub-G1 arrest and apoptosis in OF cells (Fig. 2, 3). These results indicated that HCUA initiated sub-G1 arrest and induced apoptosis of oral cancer cells in a concentration-dependent manner. The phosphorylation of p53 at Ser15 modulates its function to serve as an upstream regulator of cell cycle arrest and apoptosis (Dumaz and Meek, 1999; Shanaz et al., 2005; Long et al., 2007; Takeba et al., 2007). The protein levels of phospho-p53 (Ser15), p53, Bak, and Bax in treated cells were further measured by western blotting (Fig. 4). Quantitative analysis of western blot data revealed that HCUA stimulated significant increases of phospho-p53 (Ser15), p53, Bak, and Bax in both oral cancer cell lines (Fig. 4). Therefore, HCUA significantly induced the p53 phosphorylation at Ser15 and increased the protein amount of Bak and Bax in both oral cancer cell lines. The results revealed that HCUA might activate p53-mediated apoptosis in oral cancer cells. To examine whether HCUA affected p53-mediated transactivation of pro-apoptotic proteins, the mRNA and protein levels of Bim, Noxa, and PUMA in treated cells were determined by real-time RT-PCR and western blot analysis at 24 h post-treatment (Fig. 5). HCUA-induced phosphorylation of p53 at Ser15 correlated with upregulation of p53-mediated transcriptional activities on the mRNA expressions of Bim, Noxa, and PUMA in both oral cancer cell lines treated with 10 µM HCUA (Fig. 5A, 5B). In addition, an increased amount of Noxa and PUMA proteins were detected in cells treated with 10 µM HCUA (Fig. 5C, 5D). 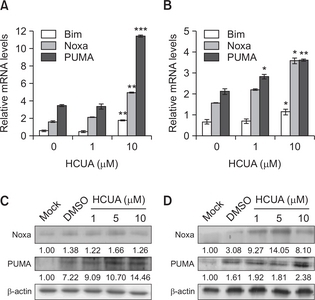 Significant increases in the mRNA and protein levels of Bim, Noxa, and PUMA were mainly detected in cells treated with high concentrations of HCUA. This may have been due to the short incubation period (24 h), which allowed for an obvious change in the early regulators of apoptosis in cells treated with low concentrations of HCUA. Since the pro-apoptotic proteins (Bax, Bim, Noxa, and PUMA) were the effectors of mitochondrial apoptosis via triggering the permeabilization of the mitochondrial outer membrane (Chipuk et al., 2010), the mitochondrial membrane potential (MMP) in treated cells was further examined using DiOC6 staining and flow cytometry (Fig. 6). HCUA at 10 µM but not 1 µM significantly decreased the MMP in both oral cancer cell lines at 48 h post-treatment, correlating with the concentration effect on the expression of Noxa and PUMA. The results illustrated that HCUA triggered p53-mediated mitochondrial apoptosis via the upregulation of pro-apoptotic proteins in oral cancer cells. Since the generation of ROS influences on p53-mediated transcription of proapoptotic proteins in mitochondrial apoptosis (Liu et al., 2005; Macip et al., 2013), accumulation of intracellular ROS in treated cells was measured using DCFH-DA staining and flow cytometry (Fig. 7). DCF fluorescence intensity (the oxidation of DCFH-DA by ROS) indicated that HCUA significantly produced intracellular ROS in oral cancer cells in concentration dependent manners, but not in normal OF (Fig. 7). To ascertain the association of HCUA-induced apoptosis with the ROS production, oral cancer cells were treated with ROS inhibitor (YCG063 or NAC) alone or in combination with HCUA, and then cell cycle changes were examined using PI staining plus flow cytometry (Fig. 8, 9). The ROS inhibitor alone did not change the cell cycle profile in oral cancer cells. Importantly, YCG063 resulted in a reduction in HCUA-induced apoptosis of oral cancer cells in a concentration-dependent manner (Fig. 8). NAC at low concentrations also significantly diminished the percentage of HCUA-induced apoptotic cells (Fig. 9). The result demonstrated that the ROS production played a critical role in HCUA-induced apoptosis in oral cancer cells. HCUA exhibited an anti-proliferative activity in oral cancer cells (IC50<25 m="" span="" class="xref">Fig. 1), and induced ROS-dependent and mitochondria-mediated apoptosis in oral cancer cells (Fig. 2–8). HCUA resulted in sub-G1 arrest and apoptosis of oral cancer cells via activating the p53-mediated transcriptional activity in a concentration-dependent manner (Fig. 2–5). Upregulation of p53-mediated pro-apoptotic proteins (Bax, Bim, Noxa, and PUMA) was associated with a decrease of mitochondrial membrane potential in HCUA-treated oral cancer cells (Fig. 5, 6). HCUA also triggered the increase of ROS production in oral cancer cells (Fig. 7). The relationship between HCUA-elicited ROS production and apoptosis in oral cancer cells was ascertained by the ROS inhibitors YCG063 and NAC (Fig. 8, 9). Interestingly, HCUA was less toxic and apoptotic to normal OFs (Fig. 1–3). The finding might be correlated with a low ROS induction in normal OFs by HCUA (Fig. 7). The anti-proliferative and apoptosis-inducing activities of HCUA from Elaeagnus oldhamii Maxim. in oral cancer cells. HCUA is a novel ursolic acid derivative with anti-oral cancer activity via the induction of ROS-dependent and mitochondria-mediated apoptosis. ROS was predominantly generated in the mitochondria and reportedly related to the early stages of apoptosis (Samhan-Arias et al., 2004; Yen et al., 2012). The anti-oral cancer mechanism of HCUA was similar to the report in that triterpenoid pristimerin induced apoptosis in human hepatocellular carcinoma HepG2 cells and U87 glioma cells through ROS-mediated mitochondrial dysfunction (Guo et al., 2013; Yan et al., 2013). In addition, HCUA increased the phosphorylated levels of p53 at Ser15 in both oral cancer cell lines in a concentration-dependent manner (Fig. 4). The p53 Ser15 phosphorylation allowed p53 to interact with the p300 coactivator and MDM2 that was linked with cell cycle arrest and mitochondrial apoptosis (Dumaz and Meek, 1999; Shanaz et al., 2005; Long et al., 2007; Takeba et al., 2007). The ROS generation has been shown to promote the phosphorylation of p53 at Ser15 that elicited p53-mediated mitochondrial apoptosis (Ito et al., 2004; Li et al., 2007; Shi et al., 2014). Thus, the ROS production might be associated with the activation of p53-mediated transcriptional targets (Bax, Bim, Noxa, and PUMA) in the mitochondrial apoptosis of oral cancer cells treated with HCUA (Fig. 4–9). Furthermore, p53 regulated the induction of apoptosis by modulating the expression of proapoptotic genes such as PUMA, Noxa, and Bim (Mancini and Moretti, 2011; Jou et al., 2016). These pro-apoptotic genes are three important members in the BH3-only family and are critical mediators of apoptosis in response to a variety of stimuli such as DNA damage and hypoxia (Oda et al., 2000; Nakano and Vousden, 2001). In addition, ursolic acid has been reported to activate p53-mediated apoptosis in melanoma cells and p53-mediated, mitochondria- and caspase-dependent human endothelial cell apoptosis (Manu and Kuttan, 2008). Previous studies have supported an anticancer mechanism of HCUA via ROS-dependent and mitochondria-mediated apoptosis in oral cancer cells. This study demonstrated that HCUA isolated from Elaeagnus oldhamii Maxim. serves the anti-proliferative and apoptosis-inducing activities against oral cancer cells. HCUA has an effective inhibitory activity on the growth of oral cancer cells via the induction of apoptosis. Moreover, HCUA induces ROS-dependent and mitochondria-mediated apoptosis in oral cancer cells through p53-mediated transactivation of proapoptotic proteins (Bax, Bim, Noxa, and PUMA). The apoptotic pathways induced by HCUA provide insights into anti-oral cancer mechanisms. The study would be useful for developing potential anticancer agents for the treatment of oral cancers. All authors had no conflict of interest. This study was supported by China Medical University under the Featured Areas Research Center Program within the framework of the Higher Education Sprout Project by the Ministry of Education, Taiwan (CHM106-6-2 and CMRC-CHM-2). This study was also supported by grants from China Medical University (CMU103-ASIA-07, CMU105-ASIA-10, and CMU105-S-20) and the Ministry of Science and Technology, Taiwan (MOST102-2628-B-039-044-MY3, and MOST105-2320-B-039-053-MY3). Fig. 1. Survival rates of oral cancer cell lines (Ca9-22 and SAS) and normal oral fibroblasts (OF) in response to cis-3-O-p-hydroxy-cinnamoyl ursolic acid (HCUA). The structure of HCUA is shown in (A). Ca9-22, SAS, and OF cells were treated with HCUA for 48 h, and then the survival rate of treated cells was calculated based on MTT assays (B). **p<0.01, ***p<0.001 compared with mock cells. Fig. 2. Effect of cis-3-O-p-hydroxycinnamoyl ursolic acid (HCUA) on cell cycle profile of oral cancer cell lines (Ca9-22 and SAS) and normal oral fibroblasts (OF). Cells were harvested 48 h post-treatment, stained with propidium iodide, and then analyzed by flow cytometry (A). The percent of Ca9-22, SAS, and OF cells in the sub G1 (apoptotic) phase after treatment with HCUA was determined (B). **p<0.01, ***p<0.001 compared with mock cells. Fig. 3. Induction of apoptosis in oral cancer cells by cis-3-O-p-hydroxycinnamoyl ursolic acid (HCUA). Ca9-22 and SAS cells as well as oral fibroblasts were harvested 48 h post-treatment, double-stained with Annexin V-FITC/PI, and then analyzed by flow cytometry (A). The percentage of cells that were Annexin V-positive/PI-negative (early phase of apoptosis) is shown (B). The percentage of cells that were Annexin V-positive/PI-positive (late apoptosis) is shown (C). *p <0.05, **p <0.01, ***p<0.001 compared with mock cells. Fig. 4. Relative protein of pro-apoptotic genes in cis-3-O-p-hydroxy-cinnamoyl ursolic acid (HCUA)-treated cells. 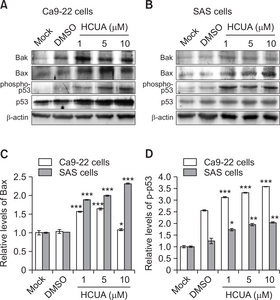 The protein levels of Bak, Bax, phospho-p53 (Ser15), and p53 in Ca9-22 (A) and SAS (B) cells treated with HCUA were characterized 48 h post-treatment by western blot analysis. The intensity of each immuno-reactive band for Bax or phospho-p53 (Ser15) was quantified using Image J; their relative intensities were normalized by β-actin (C, D), respectively. *p<0.05, **p<0.01, ***p<0.001 compared with mock cells. Fig. 5. Relative mRNA and protein levels of p53-mediated transcriptional genes in cis-3-O-p-hydroxycinnamoyl ursolic acid (HCUA)-treated cells. Relative mRNA and protein levels of Bim, Noxa, and PUMA in HCUA-treated Ca9-22 (A, C) and of SAS (B, D) cells were measured using real-time RT-PCR and western blotting, respectively. Their relative levels were normalized by GAPDH mRNA or β-actin protein. *p<0.05, **p<0.01, ***p<0.001 compared with mock cells. Fig. 6. Loss of mitochondrial membrane potential (ΔΨM) in Ca9-22 and SAS cells treated with cis-3-O-p-hydroxycinnamoyl ursolic acid (HCUA). Oral cancer cells and fibroblasts were treated with HCUA and then harvested at 48 h post-treatment, stained with DiOC6(3), and then analyzed by flow cytometry (A). The relative changes in the percentage of low MMP cells in response to HCUA are shown (B). ***p<0.001 compared with mock cells. Fig. 7. Increase of intracellular ROS production in cis-3-O-p-hydroxycinnamoyl ursolic acid (HCUA)-treated cells. 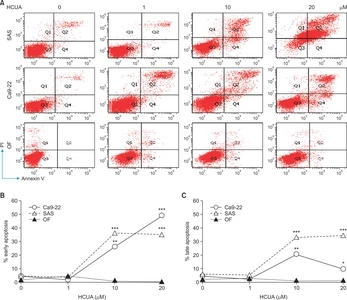 Ca9-22, SAS, and OF cells were harvested 48 h post-treatment with HCUA, stained with 2,7-dichlorodihydrofluorescein diacetate (DCF-DA), and then analyzed by flow cytometry (A). Relative fluorescent intensity of DCF in treated-cells was subsequently measured (B). ***p<0.001 compared with mock cells. Fig. 8. Reduction of cis-3-O-p-hydroxycinnamoyl ursolic acid (HCUA)-induced apoptosis in Ca9-22 cells by YCG063. Cells were treated with YCG063, HCUA, or a combination of both, harvested 48 h post-treatment, fixed by 70% ethanol, stained with a propidium iodide solution, and then examined by flow cytometry (A). The percentage of cells in the sub-G1 (apoptotic) phase is shown in (B). **p<0.01, ***p<0.001. Fig. 9. Inhibitory effect of NAC on cis-3-O-p-hydroxycinnamoyl ursolic acid (HCUA)-induced apoptosis. Ca9-22 cells were treated with NAC, HCUA, or a combination of both, harvested 48 h post-treatment, stained with propidium iodide, and then examined by flow cytometry (A). The percentage of cells in the sub-G1 (apoptotic) phase is shown in (B). *p<0.05. Cai, Q, Lin, J, Zhang, L, Lin, J, Wang, L, Chen, D, and Peng, J (2017). Comparative proteomics-network analysis of proteins responsible for ursolic acid-induced cytotoxicity in colorectal cancer cells. Tumour. Biol. 39, 1010428317695015. Chang, CF, Kuo, YL, Pu, C, and Chou, Y. J (2016). Neck dissection and stroke in patients with oral cavity cancer: a population-based cohort study. Head Neck. 39, 63-70. Chen, J, Fu, H, Wang, Z, Yin, F, Li, J, Hua, Y, and Cai, Z (2014). A new synthetic ursolic acid derivative IUA with anti-tumor efficacy against osteosarcoma cells via inhibition of JNK signaling pathway. Cell Physiol Biochem. 34, 724-733. Chipuk, JE, Moldoveanu, T, Llambi, F, Parsons, MJ, and Green, DR (2010). The BCL-2 family reunion. MolCell. 37, 299-310. Dar, BA, Lone, AM, Shah, WA, and Qurishi, MA (2016). Synthesis and screening of ursolic acid-benzylidine derivatives as potential anti-cancer agents. Eur. J. Med. Chem. 111, 26-32. Dong, H, Yang, X, Xie, J, Xiang, L, Li, Y, Ou, M, Chi, T, Liu, Z, Yu, S, Gao, Y., Chen, J., Shao, J., and Jia, L (2015). UP12, a novel ursolic acid derivative with potential for targeting multiple signaling pathways in hepatocellular carcinoma. Biochem. Pharmacol. 93, 151-162. Du, H, Chen, J, Tian, S, Gu, H, Li, N, Sun, Y, Ru, J, and Wang, J (2016). Extraction optimization, preliminary characterization and immunological activities in vitro of polysaccharidesfrom Elaeagnus angustifolia L. pulp. Carbohydr. Polym. 151, 348-357. Dumaz, N, and Meek, DW (1999). Serine15 phosphorylation stimulated p53 transactivation but does not directly influence interaction with HDM2. EMBO J. 18, 7002-7010. Guo, Y, Zhang, W, Yan, YY, Ma, CG, Wang, X, Wang, C, and Zhao, JL (2013). Triterpenoid pristimerin induced HepG2 cells apoptosis through ROS-mediated mitochondrial dysfunction. J BUON. 18, 477-485. Ito, K, Nakazato, T, Yamato, K, Miyakawa, Y, Yamada, T, Hozumi, N, Segawa, K, Ikeda, Y, and Kizaki, M (2004). Induction of apoptosis in leukemic cells by homovanillic acid derivative, capsaicin, through oxidative stress: implication of phosphorylation of p53 at Ser-15 residue by reactive oxygen species. Cancer Res. 64, 1071-1078. Jou, YJ, Chen, CJ, Liu, YC, Way, TD, Lai, C. H, Hua, CH, Wang, CY, Huang, SH, Kao, JY, and Lin, CW (2015). Quantitative phosphoproteomic analysis reveals γ-bisabolene inducing p53-mediated apoptosis of human oral squamous cell carcinoma via HDAC2 inhibition and ERK1/2 activation. Proteomics. 15, 3296-3309. Jou, YJ, Hua, CC, Lin, CS, Wang, CY, Wan, L, Lin, YJ, Huang, SH, and Lin, CW (2016). Anticancer activity of -bisabolene in human neuroblastoma cells via induction of p53-mediated mitochon-drial apoptosis. Molecules. 21, 21050601. Kim, H, Ramirez, CN, Su, ZY, and Kong, AN (2016). Epigenetic modifications of triterpenoid ursolic acid in activating Nrf2 and blocking cellular transformation of mouse epidermal cells. J. Nutr. Biochem. 33, 54-62. Ko, YC, Huang, YL, Lee, CH, Chen, MJ, Lin, LM, and Tsai, CC (1995). Betel quid chewing, cigarette smoking and alcohol consumption related to oral cancer in Taiwan. J. Oral Pathol. Med. 24, 450-453. Li, W, Zhang, H, Nie, M, Tian, Y, Chen, X, Chen, C, Chen, H, and Liu, R (2017). Ursolic acid derivative FZU-03,010 inhibits STAT3 and induces cell cycle arrest and apoptosis in renal and breast cancer cells. Acta Biochim. Biophys. Sin (Shanghai). 49, 367-373. Li, GX, Hu, H, Jiang, C, Schuster, T, and Lu, J (2007). Differential involvement of reactive oxygen species in apoptosis induced by two classes of selenium compounds in human prostate cancer cells. Int. J Cancer. 120, 2034-2043. Liang, S, Yang, R, Dong, C, and Yang, Q (2015). Physicochemical Properties and Fatty Acid Profiles of Elaeagnus mollis Diels Nut Oils. J. Oleo Sci. 64, 1267-1272. Liao, CR, Chang, YS, Peng, WH, Lai, SC, and Ho, YL (2012). Analgesic and anti-inflammatory activities of the methanol extract of Elaeagnus oldhamii Maxim. in mice. Am. J. Chin. Med. 40, 581-597. Liao, CR, Ho, YL, Huang, GJ, Yang, CS, Chao, CY, Chang, YS, and Kuo, YH (2013). One lignanoid compound and four triterpenoid compounds with anti-inflammatory activity from the leaves of Elaeagnus oldhamii maxim. Molecules. 18, 13218-13227. Liao, CR, Kuo, YH, Ho, YL, Wang, CY, Yang, CS, Lin, CW, and Chang, YS (2014). Studies on cytotoxic constituents from the leaves of Elaeagnus oldhamii maxim. in non-small cell lung cancer A549 cells. Molecules. 19, 9515-9534. Lin, J, Chen, Y, and Wei, L (2013). Ursolic acid inhibits colorectal cancer angiogenesis through suppression of multiple signaling pathways. Int. J. Oncol. 43, 1666-1674. Lin, WJ, Jiang, RS, Wu, SH, Chen, FJ, and Liu, SA (2011). Smoking, alcohol, and betel quid and oral cancer: a prospective cohort study. J. Oncol. 2011, 525976. Liu, Z, Lu, H, Shi, H, Du, Y, Yu, J, Gu, S, Chen, X, Liu, KJ, and Hu, CA (2005). PUMA overexpression induces reactive oxygen species generation and proteasome-mediated stathmin degradation in colorectal cancer cells. Cancer Res. 65, 1647-1654. Long, X, Goldenthal, MJ, and Marin-Garcia, J (2007). Oxidative stress enhances phosphorylation of p53 in neonatal cadiomyocytes. Mol. Cell. Biochem. 303, 167-174. Macip, S, Igarashi, M, Berggren, P, Yu, J, Lee, SW, and Aaronson, SA (2003). Influence of induced reactive oxygen species in p53-mediated cell fate decisions. Mol. Cell. Biol. 23, 8576-8585. Mancini, F, and Moretti, F (2011). Mitochondrial MDM4 (MDMX): an unpredicted role in the p53-mediated intrinsic apoptotic pathway. Cell Cycle. 8, 3854-3859. Manu, K, and Kuttan, G (2008). Ursolic acid induces apoptosis by activating p53 and caspase-3 gene expressions and suppressing NF-kappaB mediated activation of bcl-2 in B16F-10 melanoma cells. Int. Immunopharmacol. 8, 974-981. Mendes, VI, Bartholomeusz, GA, Gandhi, V, and Salvador, A (2016). Synthesis and cytotoxic activity of novel A-ring cleaved ursolic acid derivatives in human non-small cell lungcancer cells. Eur. J. Med. Chem. 123, 317-331. Misra, S, Chaturvedi, A, and Misra, NC (2008). Management of gingivobuccal complex cancer. Ann. R. Coll. Surg. Engl. 90, 546-553. Nakanishi, T, Song, Y, He, C, Wang, D, Morita, K, Tsukada, J, Kanazawa, T, and Yoshida, Y (2016). Relationship between triterpenoid anticancer drug resistance, autophagy, and caspase-1 in adult T-cell leukemia. PeerJ. 4, e2026. Nakano, K, and Vousden, KH (2001). PUMA a novel proapoptotic gene, is induced by p53. MolCell. 7, 683-694. Neville, BW, and Day, TA (2002). Oral cancer and precancerous lesions. CA Cancer J. Clin. 52, 195-215. Oda, E, Ohki, R, Murasawa, H, Shibue, T, Yamashita, T, Tokino, T, Taniguchi, T, and Tanaka, N (2000). Noxa, a BH3-only member of the Bcl-2 family and candidate mediator of p53-induced apoptosis. Science. 288, 1053-1058. Ou, X, Liu, M, and Luo, H (2014). Ursolic acid inhibits leucine-stimulated mTORC1 signaling by suppressing mTOR localization to lysosome. PLoS ONE. 9, e95393. Panahi, Y, Alishiri, GH, Bayat, N, Hosseini, SM, and Sahebkar, A (2016). Efficacy of Elaeagnus Angustifolia extract in the treatment of knee osteoarthritis: a randomized controlled trial. EXCLI J. 15, 203-210. Parkin, DM, Bray, F, Ferlay, J, and Pisani, P (2005). Global cancer statistics, 2002. CA Cancer J. Clin. 55, 74-108. Ren, L, Cao, QX, Zhai, FR, Yang, SQ, and Zhang, HX (2016). Asiatic acid exerts anticancer potential in human ovarian cancer cells via suppression of PI3K/Akt/mTOR signalling. Pharm. Biol. 54, 2377-2382. Samhan-Arias, AK, Martin-Romero, FJ, and Gutierrez-Merino, C (2004). Kaempferol blocks oxidative stress in cerebellar granule cells and reveals a key role for reactive oxygen species production at the plasma membrane in the commitment to apoptosis. Free. Radic. Biol. Med. 37, 48-61. Shanaz, TAR, Dellaire, G, Cuddihy, A, Jalali, F, Vaid, M, Coackley, C, Folkard, M, Xu, Y, Chen, PC, Chen, DJ, Lilge, L, Prise, KM, Jones, DPB, and Bristow, RG (2005). Evidence for the direct binding of phosphorylated p53 to sites of DNA breaks in vivo. Cancer Res. 65, 10810-10821. Shi, Y, Nikulenkov, F, Zawacka-Pankau, J, Li, H, Gabdoulline, R, Xu, J, Eriksson, S, Hedstrom, E, Issaeva, N, Kel, A, Arner, ES, and Selivanova, G (2014). ROS-dependent activation of JNK converts p53 into an efficient inhibitor of oncogenes leading to robust apoptosis. Cell Death Differ. 21, 612-623. Su, CC, Lin, YY, Chang, TK, Chiang, CT, Chung, JA, Hsu, YY, and Lian, IB (2010). Incidence of oral cancer in relation to nickel and arsenic concentrations in farm soils of patients’ residential areas in Taiwan. BMC PublicHealth. 10, 67. Sturgis, EM (2004). A review of social and behavioral efforts at oral cancer preventions in India. Head Neck. 26, 937-944. Takeba, Y, Kumai, T, Matsumoto, N, Nakaya, S, Tsuzuki, Y, Yanagids, Y, and Kobayashi, S (2007). Irinotecan activates p53 with its active metabolite, resulting in human hepatocellular carcinoma apoptosis. J. Pharmacol. Sci. 104, 232-242. Vokes, EE, Weichselbaum, RR, Lippman, SM, and Hong, WK (1993). Head and neck cancer. N. Engl. J. Med. 328, 184-194. Wang, CY, Huang, SC, Zhang, Y, Lai, ZR, Kung, SH, Chang, YS, and Lin, CW (2012). Antiviral ability of kalanchoe gracilis leaf extract against Enterovirus 71 and coxsackievirus A16. Evid. Based Complement. Alternat. Med. 2012, 503165. Wu, J, Lei, H, Zhang, J, Chen, X, Tang, C, Wang, W, Xu, H, Xiao, W, Gu, W, and Wu, Y (2016). Momordin Ic, a new natural SENP1 inhibitor, inhibits prostate cancer cell proliferation. Oncotarget. 7, 58995-59005. Xiang, L, Chi, T, and Tang, Q (2015). A pentacyclic triterpene natural product, ursolic acid and its prodrug US597 inhibit targets within cell adhesion pathway and prevent cancer metastasis. Oncotarget. 6, 9295-9312. Yan, YY, Bai, JP, Xie, Y, Yu, JZ, and Ma, CG (2013). The triterpenoid pristimerin induces U87 glioma cell apoptosis through reactive oxygen species-mediated mitochondrial dysfunction. Oncol. Lett. 5, 242-248. Yang, TC, Li, SW, Lai, CC, Lu, KZ, Chiu, MT, Hsieh, TH, Wan, L, and Lin, CW (2013). Proteomic analysis for Type I interferon antagonism of Japanese encephalitis virus NS5 protein. Proteomics. 13, 3442-3456. Yen, CY, Chiu, CC, Haung, RW, Yen, CC, Huang, KJ, Chang, KF, Hseu, YC, Chang, FR, Chang, HW, and Wu, YC (2012). Antiproliferative effects of goniothalamin on Ca9-22 oral cancer cells through apoptosis, DNA damage and ROS induction. Mutat. Res. 747, 253-258. Yin, R, Li, T, Tian, J, Xi, P, and Liu, RH (2016). Ursolic acid, a potential anticancer compound for breast cancer therapy. Crit. Rev. Food Sci. Nutr. 28, 1-7. Zhang, DM, Tang, PMK, and Chan, JYW (2007). Anti-proliferative effect of ursolic acid on multidrug resistant hepatoma cells R-HepG2 by apoptosis induction. Cancer Biol. Ther. 6, 1377-1385.